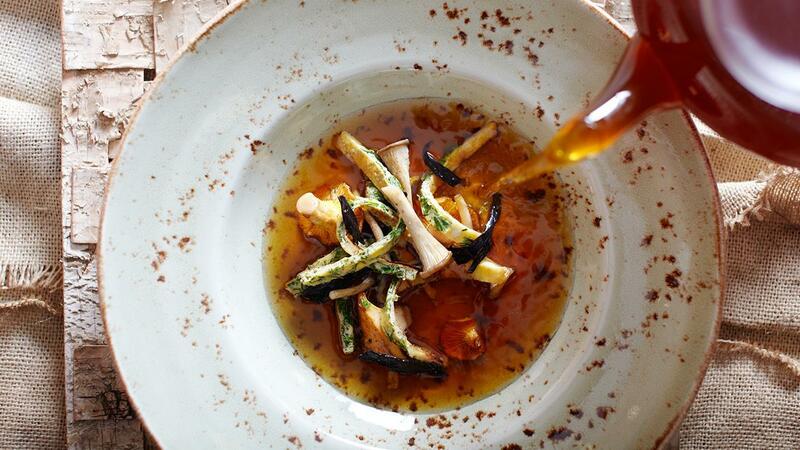 A fantastic way to serve this particular broth is to present it in a glass teapot on the table. Pour it over the garnish when guests are seated. This creates an additional experience. Fry the mushrooms briefly and season with salt and pepper. Pick the herbs and chop the chives. Beat the eggs in a separate bowl and add the spices and some pepper. Heat some butter in a frying pan to make the spice crepes. Cut the crepes into strips. Divide the mushrooms and herb crepes over the plates. Strain the broth through a fine sieve and pour the hot broth onto the plates at the table.